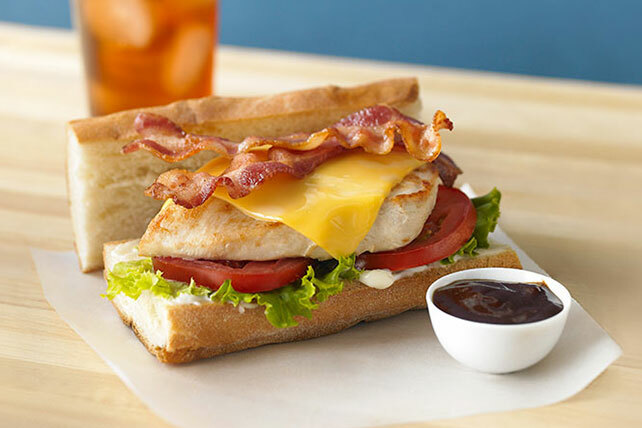 When a sub recipe begins with crisp, skillet-cooked bacon, it's probably a winner! That's certainly true of this chicken-and-cheese sandwich. Cook bacon in large skillet until crisp. Remove bacon from skillet, reserving 1 Tbsp. drippings in skillet. Drain bacon on paper towels. Add chicken to reserved drippings in skillet; cook 5 to 6 min. on each side or until done (165ºF.) Top with Singles; cover. Remove from heat. Let stand 1 min. or until Singles are melted. Spread baguette pieces with mayo; fill with chicken, bacon, lettuce and tomatoes. Serve with barbecue sauce.